"When I put it together a second later, he had passed out of sight. As I headed home, shielding my eyes against the sun, so bright after the darkness of the woods, I realized that I'd been so caught up in thinking about how things with him had ended, I'd almost forgotten how they had begun." OOOh nice tease! Haven't heard of this one! Hope you enjoy the rest! 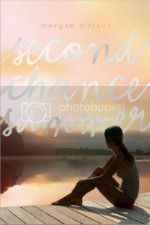 The "him" in this must be the one getting the "second chance" mentioned in the title. Sounds interesting. Thanks for sharing. My teaser is here. This is one of my most anticipated reads this summer! Great pick!! This is such a great idea. So I had to try it. Looks good. Need to check this one out for sure.